Combine my last product review of 2014 with my first of 2015 and voila! It's like I knew this was gonna happen. Actually, truthfully, I first became aware of the existence of Trader Joe's Sweet Sriracha Uncured Bacon Jerky through our good buddy Marvo at The Impulsive Buy. How he, on a rock in the middle of the Pacific Ocean enjoying 70-plus degree weather, can be first tipped off about it before I can is amazing. Must be all the time I spend grooming the icicles out of my beard here in the 'burgh. No matter, once I had the good news proclaimed unto me, I immediately became like the dogs in the Beggin' Strips commercials - "Bacon! Baconbaconbaconbacon! Bacon!" - complete with the deep doggy snuffs and all, and as soon as my master, I mean my wife, allowed me to go to TJ's to procure some, I came home with two fresh sacks. Sandy I just devoured our third. Yes, I made another trip to TJ's just to get a couple more packs, all under the guise of "refamiliarizing myself with the taste before writing my review." The things we have to tell ourselves....truth be told, it's just that darn good. Be aware, you gotta like spicy - really like spicy a lot - to have a chance of ingesting this jerky. This sriracha's coming atcha' and is not playing any games. It's fully, peppery, fermented heat that will warm your insides through and through. Yet there's an initial sweetness that, although shortlived, is enough to ever-so-slightly play off that heat for a little nuance and character that will help convince your brain that your body isn't trying to digest straight napalm. All of that is in the thicky, sticky, litte-bit-goopy glaze that coats all of the glorious, thickcut bacon. It's meaty, with only a little fat here and there, and is easily chewable - much more like bacon bacon and not actual jerky. The doneness straddles a good line between floppy and crispy, with a little bit of both here and there, like any good bacon should be. Fortunately, even with all the spicy sriracha all over the place, the taste of the meat pokes through as well, which really kind of binds the whole product together. This is gooooood. Really really good. But, as jerky tends to be, kinda pricey. 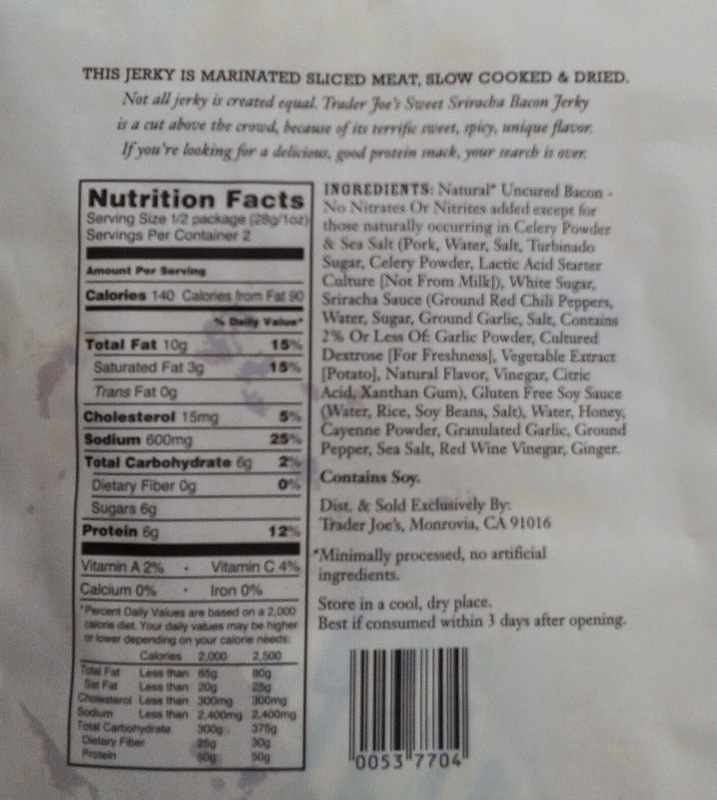 Most TJ's jerkies are in the $6 range for about 3.5 or 4 ounces. This bacon jerky? $5.49...for a measly two ounces. I mean, really, for that price you can't put in a couple more slices? There's some print on the bag stating "best if consumed within three days after opening." That's silly, TJ's - try making this last three minutes, let alone three days. I guess, though, judging by my purchasing habits of the past couple days, my price complaint is only pretty minor. 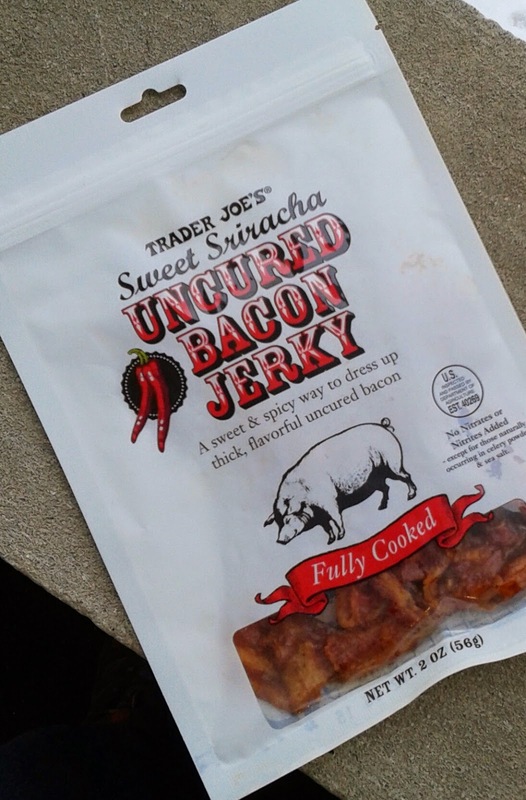 Other than that, this bacon jerky is something I feel is made especially just for me. Sandy loves it as well - she prefers her bacon to be cooked to be crispier than these slices were, but she loves that the bites aren't as chewy or stringy as most jerky is, and how this easily could have been. I'm pretty hesitant to start off the New Year with two straight pantheon reviews - that is an honor that's neither taken lightly nor given out often - but sometimes, you just gotta call it as you see it. Used it as a topping for a wedge salad I made using TJ's new chunky blue cheese dressing/dip (in the refrigerated section)... so good! Nice post. Its a great oppertunity to read this post. Thank you for this post. I would like to share that I am a fan of Tag Heuer Watches. This stuff is crack. It's almost like meat candy. Good thing it's so expensive so I don't eat five bags in one sitting.